Emma Samson is a current Masters student at the University of Aberdeen who will join PROBIS for a period of 6 months. She will be carrying out two projects. The first will be a theoretical investigation of the evolution of emigration behaviours in males and females, under the influence of settlement rules. The second will involve developing a model to looking at the effect of personality and boldness in the invasive capacity of the round goby, Neogobius melanostomus. Fia Finn has been engaged for a 6 months period and she is sampling the dragonfly species (Crocothemis erythraea) all over Europe to measure phenotypic and genetic variation along the invasion gradient. She is traveling a lot and having fun with the scarlets that are apparently very quick when they fly! She will also run the very first test of dragonfly dispersal in the Metatron. Nicolas Canto has been engaged for a 6 months period and he is in charge of the Pseudorasbora parva sampling in the Garonne drainage, as well as the setting of experiments in this fish species. He is a man who can help you on all aspects of our daily tasks: he is sometimes a computer engineer, a field assistant, a secretary or a cooker. In brief he is indispensable. Miguel Baltazar-Soares has been engaged for 24 months as post-doctorate. Miguel will mainly deal with genomic data on all three species. He will be based in Kiel and regularly received DNA from our model species. His research interests focus on the use of population genetics theory to understand the impact of geological and eco-evolutionary processes in the distribution and dynamics of natural populations. For his PhD, he investigated the role of environmental (ocean currents) and selective (invasive parasite) pressures to the population dynamics and evolution of a migratory fish species, the European eel (Anguilla anguilla). 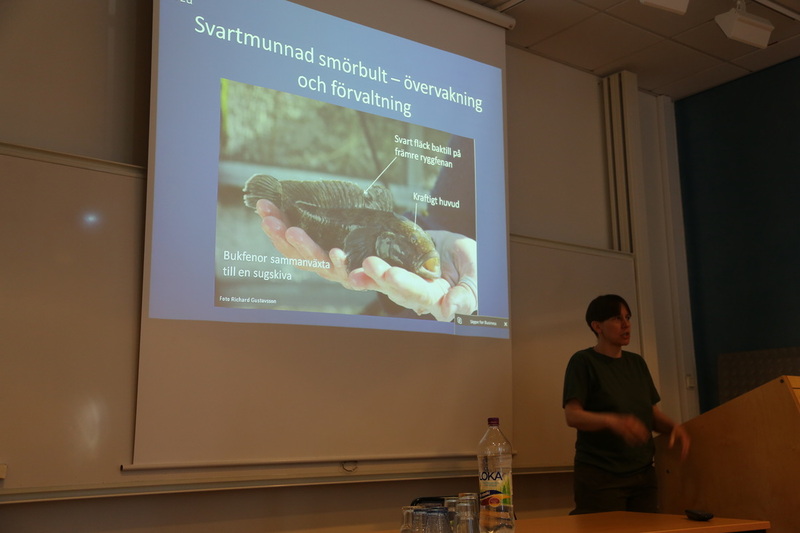 He defends that interdisciplinary efforts are essential to (more) accurately understand how the multitude of factors acting in natural environments gave rise to the biodiversity we enjoy nowadays.We hope that the interdisciplinary efforts we want to bring within PROBIS will be succesful! Lieven Therry has been engaged for 20 months as post-doctoral researcher and will work with the range-expanding dragonfly Crocothemis erythraea. He will be based in the laboratory Station d’Ecologie Expérimentale du CNRS at Moulis. His research interests focus on eco-evolutionary processes during the range expansion of species and its consequences on dispersal-related traits and life history. During his PhD at the University of Leuven, he investigated eco-evolutionary processes occurring during the recent range-expansion of the damselfly Coenagrion scitulum. The main aim of the study on the range expansion of C. erythraea is to identify changes in phenotypic traits along the expansion gradient, which will lead to a better understanding of the particular traits that are important at the different stages of range expansion. The study will be largely focused on dispersal by executing experiments with adults in the metatron. Yahui Zhao, an associate professor from the Institute of Zoology, Chinese Academy of Sciences, is a visiting researcher for three months at the CNRS station of Moulis in France. His research interests include the taxonomy, evolution and conservation of freshwater fishes. He is also a well-known specialist on cavefish. At the station, he will assist to deal with the dispersal experiments on top mouth gudgeon (Pseudorasbora parva). And also he will attend several field surveys on top mouth gudgeon with Simon Blanchet and his team in France. He used to execute a large-scale collection on this fish with European colleagues for invasion studies in China. Spring 2016. 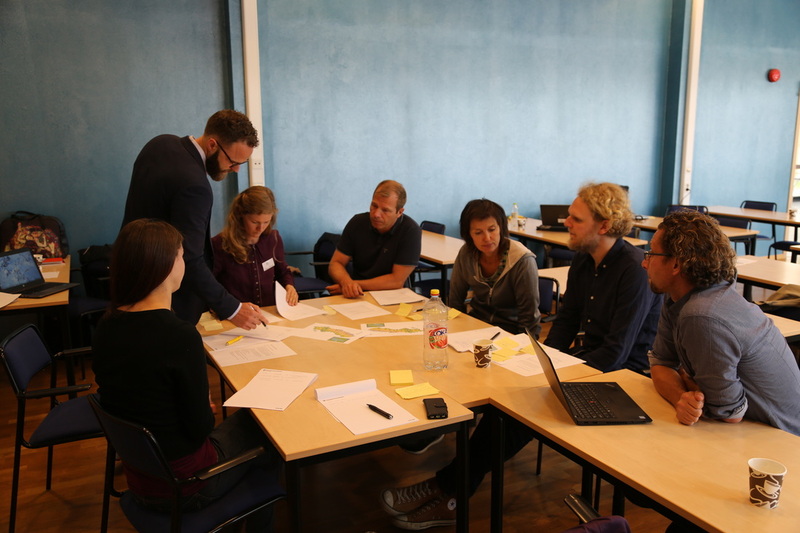 Kalmar, Sweden: Round Goby Workshop to bring together academics and stakeholder to share information and identify approaches for more effectively managing and mitigating against the impacts of the invasion. 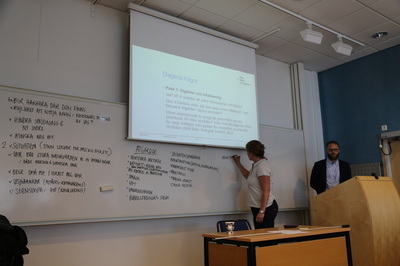 Emma Samson and Justin Travis (University of Aberdeen) attended from PROBIS and presented the initial results of simulations run using the RangeShifter software of Round Goby spreading through the Baltic. Subsequently, information provided by participants at the workshop has resulted in refinement of the model and it has been used to address a key issue identified by participants: the potential risk that Round Goby’s pose to overwintering long-tailed ducks. This is a great example on how tools developed within PROBIS can be used for other cases of biological invasions. Pictures from the workshop are shown below. Spring 2016. Three papers related to the project went out recently. The first one on invasion risk of Pseudorasbora parva at the worldwide scale, the second one on thermal adaptation of Tracheliastes polycolpus at the local scale, and the third one is a review discussing the processes of dispersal and migration. Click the titles to reach the abstracts. Spring – winter 2015. We (Lieven, Fia, Nicolas, Simon and Julien) conducted a series of experiments with the aim to investigate patterns in trait variation, thermal performance and impact on ecosystem functioning across an age-gradient of range expansion of the dragonfly Crocothemis erythraea. 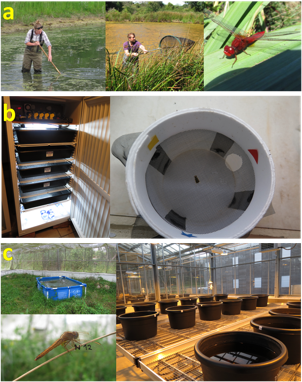 Below some impressions of the experiments (a: collecting larvae and egg clutches across Western Europe; b: breeding and laboratory experiments; c: dispersal experiment in the Metatron and heated mesocosm experiment). We thank the many volunteers (Charlotte, Christophe, Hajnalka, Iago, Jens, K., Klaus-Jürgen, Philippe, Sharon, Yohan and others) for their great help in locating populations or collecting egg clutches. Autumn 2015. Two papers related to the project went out recently. The first one on invasion roads of Tracheliastes polycolpus (French partners), the other one on the economic and ecological risks posed by Pseudorasbora parva (French and Turkish partners). Click the titles to reach the abstracts. Autumn 2015. Rudy Gozlan published a new large-audience paper for The Conversation about the risks posed by the invasion of Pseudorasbora parva throughout the world. Click the picture below to follow the link to the paper! Spring 2015. We (Nicolas, Yahui, I and colleagues) are completing the Pseudorasbora parva sampling in the Garonne drainage so as to better understand patterns of colonization in complex networks. We aim at sampling 50 individual in 15-20 sites in the drainage, from upstream to downstream an including river branches. Below is a series of nice pictures taken by Yahui. Summer 2014. This summer Fia spent a lot of time traveling across Europe to sample Crocothermis erythrea, one of our model species. You can enjoy below the final sampling map with negative and positive sampling sites, as well as sample size. We thanks everyone who directly or indirectly participates to this huge sampling. Spring 2014: Rudy Gozlan, our topmouth gudgeon specialist, went to Turkey and together with our colleagues Serhan Tarkan and Sevan Agdamar sampled several populations in a river drainage. Here is a small video with nice pictures and a good overview of how we proceed on the field.